A substantial collection of 16 grand old adventure yarns’space operas, more or less—written between 1948 and —71 and compiled by editor Dozois (the annual Year’s Best Science Fiction anthology, etc.). Dozois gloomily remarks that many of today’s younger audience have never heard of the authors represented here; even those few readers who recognize some of the names have never read anything written by them. This volume, then, attempts to help preserve the best of science fiction’s legacy. The famous (at least to earlier generations of readers) names include: A.E. 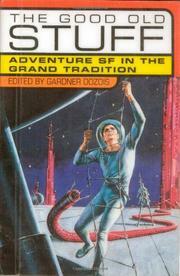 van Vogt’s “The Rull” (human ingenuity vs. aliens with superior nervous systems); Jack Vance’s “The New Prime” (in selecting a galactic ruler, the crazy man becomes king); C. M. Kornbluth’s “That Share of Glory” (far-future industrial-cultural missionaries); Murray Leinster ‘s “Exploration Team” (humans and their animal partners tackle dangerous new worlds together); Poul Anderson’s “The Sky People” (civilization vs. barbarism, with a sting in the tail); Roger Zelazny’s “The Doors of his Face, the Lamps of his Mouth” (a realistically depicted pulp-tradition Venus awash with oceans containing huge swimming saurians). Women can write gripping adventures, too, as equally good but less famous yarns from Leigh Brackett, Ursula K. LeGuin, and James Tiptree Jr. (Alice Sheldon) demonstrate. Also represented: James H. Schmitz, L. Sprague de Camp, Gordon R. Dickson, Cordwainer Smith, Brian W. Aldiss, H. Beam Piper, and Fritz Leiber. Don’t let these Golden Oldies disappear into limbo: adopt some today.